Kolwezi, Democratic Republic of Congo - January 30, 2019 (Newsfile Corp.) (Investorideas.com Newswire) Robert Friedland and Yufeng "Miles" Sun, Co-Chairmen of Ivanhoe Mines (TSX: IVN) (OTCQX: IVPAF), announced today that exploration hole DD1450 drilled at the Kamoa North prospect area, on the 397-square-kilometre Kamoa-Kakula mining licence, has intersected 13.05% copper over 22.3 metres (true thickness), at a 2% copper cut-off grade, in a remarkably-thick, flat-lying, ultra-high-grade deposit beginning at a depth of only 190 metres below surface. 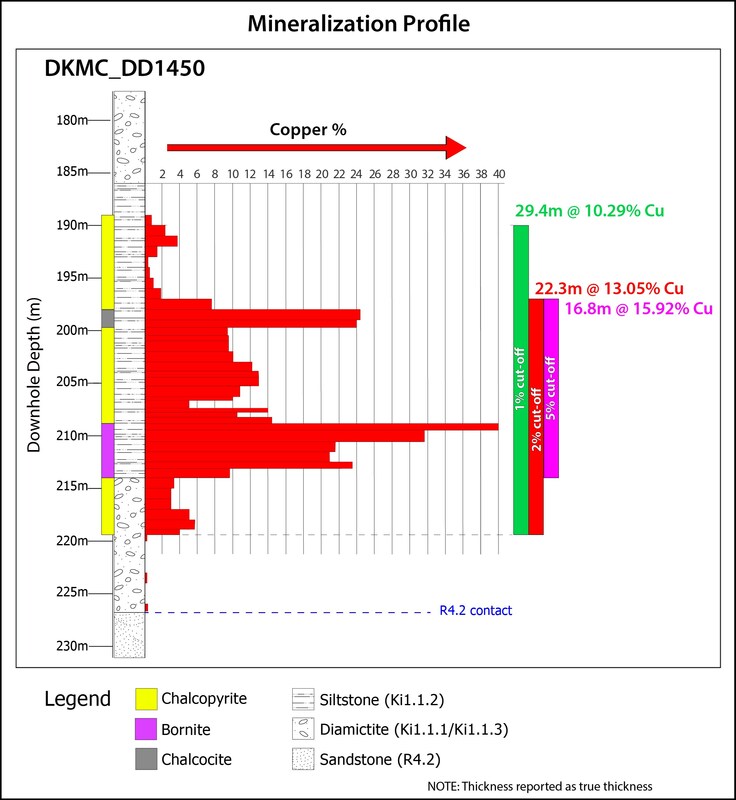 Drill hole DD1450 includes multiple, one-metre intersections with copper grades higher than 20% copper, including a 40%-copper intercept (see Figure 1 for a detailed mineralization profile). At a cut-off of 5% copper, DD1450's intersection is 15.92% copper over 16.8 metres (true thickness). Using a lower cut-off grade of 1% copper, the intersection is 10.29% copper over 29.4 metres (true thickness), beginning at a depth of only 190 metres below surface. The new drill hole, DD1450, is located approximately 18 kilometres north of the Kamoa-Kakula Project's planned initial mine at the Kakula Deposit and approximately eight kilometres north of Kamoa's Kansoko Mine development (see Figure 2). DD1450 is one of 22 recently-drilled holes at Kamoa North. 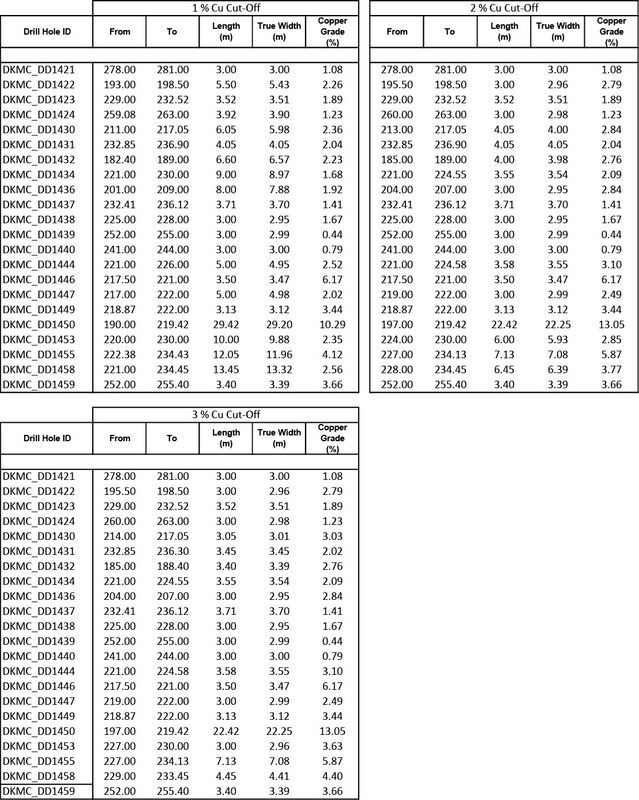 A complete list of assay results, at various cut-off grades, from the recent holes is in Table 1 on page 11. DD1450 is further evidence of the emergence of Kamoa North as a prospective new, shallow mining area on the Kamoa-Kakula mining licence. 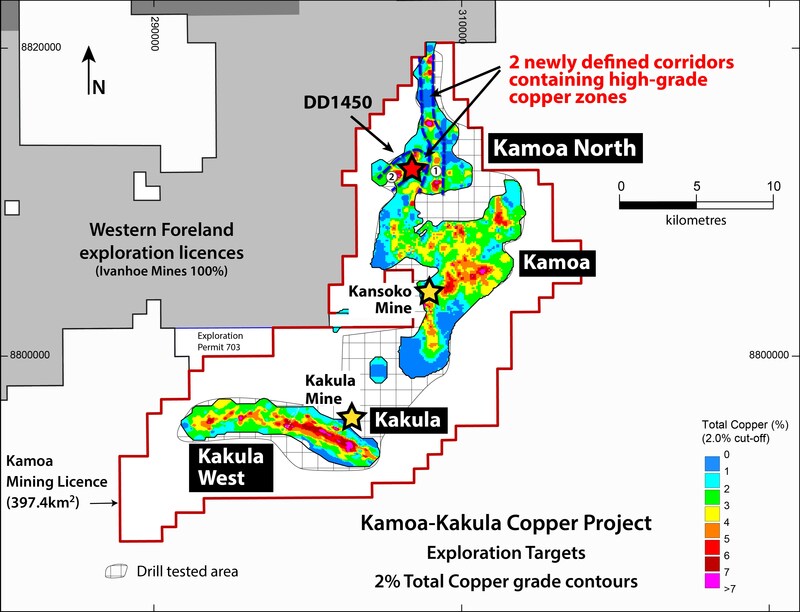 Previous drill holes in the area had delineated zones of shallow, flat-lying, thick, high-grade copper, but DD1450 is the thickest, highest-grade copper intersection since drilling commenced on the Kamoa-Kakula Project more than a decade ago. "DD1450 exceeds anything previously encountered in all of our years of delineating resources on the project," said Mr. Friedland. "The flat-lying, 10% copper intersection in hole DD1450 is almost 30 metres, or 100-feet thick - essentially equivalent to a 10-storey building - and the high-grade copper is less than 200 metres below surface. If we apply a 5% copper cut-off to the intersection, the grade increases to approximately 16% copper and it's still almost 17 metres thick, or approximately 56 feet. "Hole DD1450 is three times richer on a copper-grade-times-thickness measurement than any previous hole drilled at Kamoa-Kakula. Now our immediate exploration focus is to find more of this near-surface, bonanza-grade ore."
"On behalf of everyone at Ivanhoe Mines, I want to wish our Chinese partners at Kamoa-Kakula and our Congolese stakeholders a happy Year of the Pig," Mr. Friedland added. Close-spaced drilling is underway in the vicinity of DD1450 with the intention of better understanding the controls and the orientation of the ultra-high-grade zone. Initial indications suggest growth faulting in the proximity of DD1450 may have played a part in enhancing fluid flow during the mineralizing process. The exceptional grade and thickness of the intersection means that even a zone of limited dimensions could prove extremely significant if targeted early from a future Kamoa North decline. The tier-one Kamoa-Kakula Project is approximately 25 kilometres west of the mining centre of Kolwezi in the Democratic Republic of Congo (DRC). The project is a joint venture between Ivanhoe Mines, Zijin Mining and the DRC government. An independent Mineral Resource estimate published in February 2018 established Kamoa-Kakula as the world's fourth-largest copper discovery. Kamoa-Kakula's copper grades are the highest, by a wide margin, of the world's top 10 copper deposits. Figure 1. 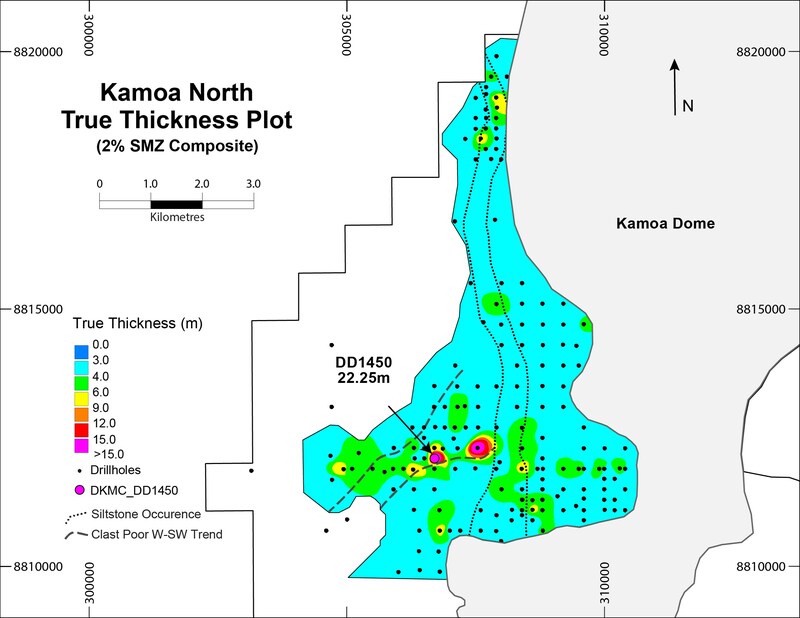 Mineralization profile for drill hole DD1450 at Kamoa North, beginning at a depth of 190 metres below surface. Figure 2. Kamoa-Kakula mining licence, showing drill hole DD1450, the Kamoa North Exploration Area, the Kamoa and Kakula Mineral Resource areas and the adjacent, 100%-owned Western Foreland exploration-licence area. 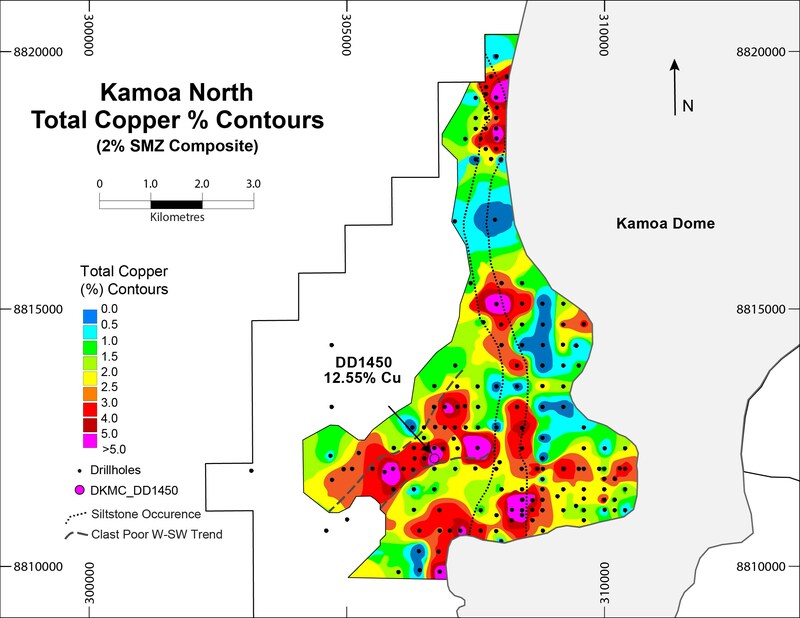 The newly delineated copper corridors at Kamoa North occur on the western flank of the un-mineralized Kamoa Dome. The most significant corridor trends north and south for more than nine kilometres before swinging to the northwest and is projected to continue onto the adjacent Western Foreland exploration licences that are 100%-owned by Ivanhoe Mines. The second corridor trends west-southwest, away from the Kamoa Dome and toward the West Scarp Fault, over a distance of three to four kilometres. The copper corridors are indicated with dashed and dotted lines in figures 3 and 4 (pages 6 and 7). The corridors are partly within the previously defined Inferred Mineral Resources, but the definition provided by additional drilling has allowed significantly increased continuity of grade to be established and then extended along strike into previously untested areas. The recognition of high-grade trends in areas previously tested by wider-spaced drilling reflects a growing understanding of the controls on mineralization at Kamoa-Kakula. Mineralization thicknesses range from three metres up to 30 metres at a 1% copper cut-off. The mineralized horizon generally is in the region of 150 metres to 300 metres below surface, except on the west side of the West Scarp Fault, where it strikes roughly north-south and dips gently to the west at between five and 10 degrees. Copper sulphide mineralization at Kamoa North tends to be bottom-loaded and shows typical downward zonation from chalcopyrite to bornite to chalcocite. Chalcopyrite dominates in the lower-grade intercepts and when mineralization extends into the overlying pyritic siltstone. Fine-grained bornite and chalcocite dominate in the highest-grade intersections. The Kamoa North discovery area already is accessible by an all-season road that connects with the provincial road to Kolwezi and is close to the newly installed electricity line running from Kamoa North to the planned Kansoko and Kakula mines. Figure 3. Contours of copper grade at Kamoa North for 2% composites. Figure 4. True thickness of copper grade at Kamoa North for 2% composites. Figure 5. 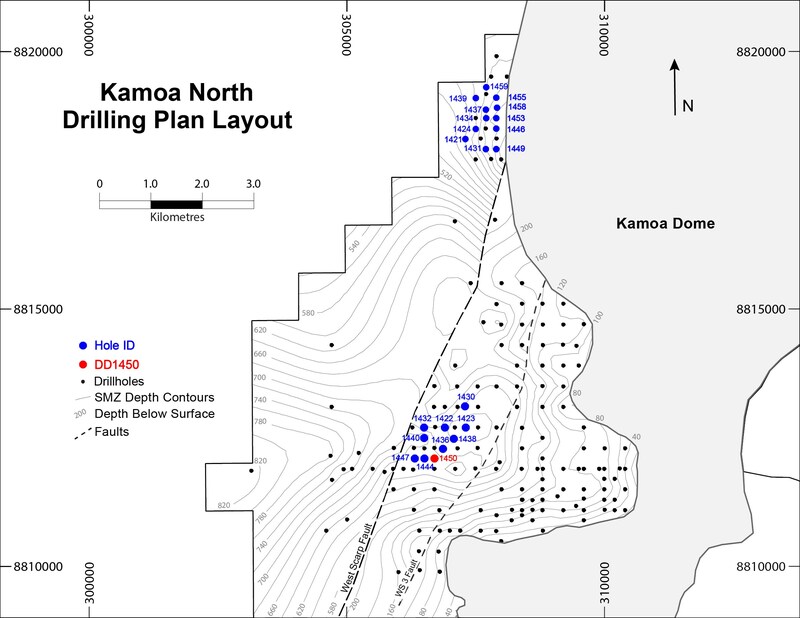 Kamoa North drilling plan showing collars of recent drill holes. DD1450 is highlighted in red. Photo. Core from drill hole DD1450 with copper grades. Photo. Rig drilling hole DD1484 at the Kamoa North discovery area. Hole DD1450 was drilled vertically from the same location. DD1484 is angled to the north, aiming to hit high-grade copper mineralization approximately 100 metres north of where DD1450's intersection occurred. The pre-feasibility study (PFS) for the planned, initial six million-tonne-per-annum (Mtpa) Kakula Mine is expected to soon be completed and will be a key part of the new Kamoa-Kakula Integrated Development Plan. The PFS will provide more detailed information related to the project's economic assumptions and will incorporate results from detailed engineering and optimization work. An updated Kamoa-Kakula Mineral Resource estimate, which will incorporate recent drilling results from the project, is being prepared as part of the Kamoa-Kakula Integrated Development Plan. Ivanhoe and Zijin also are exploring potential options to expand future production. The 2017 PEA noted the potential for a 12 Mtpa scenario, to be achieved through the sequential development of both the Kakula and Kansoko mines. Based on subsequent discoveries, including Kakula West and Kamoa North, Ivanhoe and Zijin also are exploring the potential for expanding production to 18 Mtpa, and beyond. Exploration is continuing to progress at Kamoa-Kakula and to the west, on Ivanhoe's 100%-owned exploration licences in the adjacent Western Foreland area, where drilling recently discovered a large, high-grade zone of copper at Makoko. Ivanhoe believes this phased approach to building what ultimately could become one of the world's largest copper-mining complexes will provide an attractive combination of lower initial capital cost while maintaining key operating efficiencies and economies of scale. The newly delineated, high-grade zones at Kamoa North are near surface and flat lying. Given this depth and dip, they could be amenable to traditional, non-fill room-and-pillar-style mining that is highly productive and economically efficient. The potential construction of additional shallow access declines in the Kamoa North area will be studied, which would expand the range of options presently being considered for the development of Kamoa-Kakula. Both the Kakula Discovery and the earlier Kamoa Discovery continue to remain open for expansion. The current, combined Kamoa-Kakula Indicated Mineral Resources total 1.34 billion tonnes grading 2.72% copper, containing 80.7 billion pounds of copper at a 1.0% copper cut-off grade and an approximate minimum thickness of 3.0 metres. At a higher, 1.5% copper cut-off grade and a minimum thickness of 3.0 metres, the combined Kamoa-Kakula Indicated Mineral Resources now total 1.03 billion tonnes grading 3.17% copper, containing 71.7 billion pounds of copper. Kamoa-Kakula also has Inferred Mineral Resources of 315 million tonnes grading 1.87% copper, containing 13.0 billion pounds of copper at a 1.0% copper cut-off grade and an approximate minimum thickness of 3.0 metres. At a 1.5% copper cut-off grade and a minimum thickness of 3.0 metres, Kamoa-Kakula's Inferred Mineral Resources now total 183 million tonnes grading 2.31% copper, containing 9.3 billion pounds of copper. Research by Wood Mackenzie also confirms that the Kamoa-Kakula Project is the world's largest, high-grade (>2.5% copper grade) copper deposit and the world's largest, undeveloped copper deposit, based on contained copper in the project's Measured and Indicated Mineral Resources. Table 2. 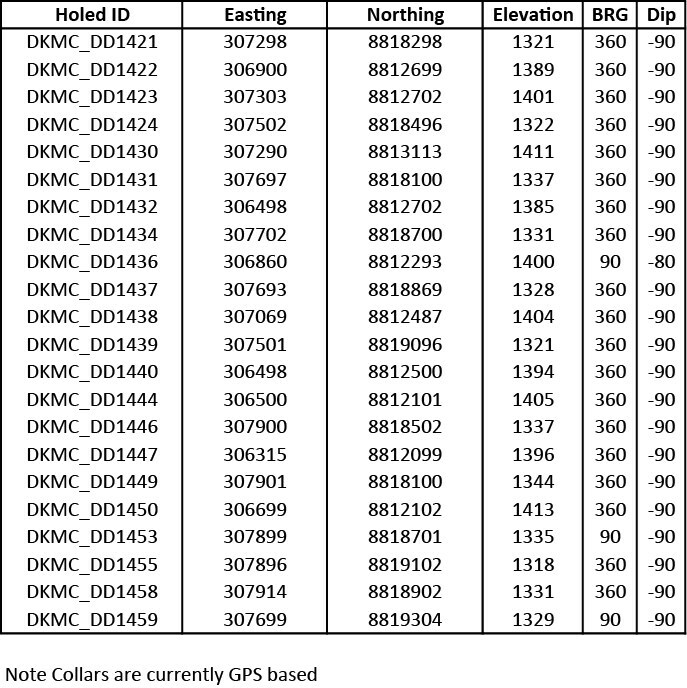 Collars for holes included in news release. Scientific and technical information in this news release has been reviewed and approved by Stephen Torr, P.Geo., Ivanhoe Mines' Vice President, Project Geology and Evaluation, a Qualified Person under the terms of National Instrument 43-101. Mr. Torr is not independent of Ivanhoe Mines. Mr. Torr has verified the technical data disclosed in this news release not related to the current Mineral Resource estimate disclosed herein. Ivanhoe Mines maintains a comprehensive chain of custody and quality assurance and quality control (QA/QC) program on assays from its Kamoa-Kakula Project. Half-sawn core is processed at the Kamoa-Kakula on-site preparation laboratory and prepared samples then are shipped by secure courier to Bureau Veritas Minerals (BVM) Laboratories in Australia, an ISO17025-accredited facility. Copper assays are determined at BVM by mixed-acid digestion with ICP finish. Industry-standard certified reference materials and blanks are inserted into the sample stream prior to dispatch to BVM. For detailed information about assay methods and data verification measures used to support the scientific and technical information, please refer to the March 2018 technical report titled, "Kamoa-Kakula Project - the Kamoa-Kakula 2018 Resource Update", on the Ivanhoe Mines SEDAR profile at www.sedar.com and available at www.ivanhoemines.com. Certain statements in this release constitute "forward-looking statements" or "forward-looking information" within the meaning of applicable securities laws, including without limitation, (1) statements regarding the expectation that the pre-feasibility study (PFS) for the planned, initial six million-tonne-per-annum (Mtpa) Kakula Mine will be soon completed. Such statements involve known and unknown risks, uncertainties and other factors which may cause the actual results, performance or achievements of the company, or industry results, to be materially different from any future results, performance or achievements expressed or implied by such forward-looking statements or information. Such statements can be identified by the use of words such as "may", "would", "could", "will", "intend", "expect", "believe", "plan", "anticipate", "estimate", "scheduled", "forecast", "predict" and other similar terminology, or state that certain actions, events or results "may", "could", "would", "might" or "will" be taken, occur or be achieved. These statements reflect the company's current expectations regarding future events, performance and results and speak only as of the date of this release. All such forward-looking information and statements are based on certain assumptions and analyses made by Ivanhoe Mines' management in light of their experience and perception of historical trends, current conditions and expected future developments, as well as other factors management believe are appropriate in the circumstances. These statements, however, are subject to a variety of risks and uncertainties and other factors that could cause actual events or results to differ materially from those projected in the forward-looking information or statements including, but not limited to, unexpected changes in laws, rules or regulations (including retroactive application), the failure of contractual agreements with the State to be honoured in whole or in part, or in the enforcement or application of laws, rules and regulations by applicable authorities; the failure of parties to contracts to perform as agreed; social or labour unrest; changes in commodity prices, including the price of copper; unexpected failure or inadequacy of infrastructure, or delays in the development of infrastructure, the failure of exploration programs or other studies to deliver anticipated results or results that would justify and support continued studies, development or operations, and the results of economic studies and evaluations. Other important factors that could cause actual results to differ from these forward-looking statements also include those described under the heading "Risk Factors" in the company's most recently filed MD&A as well as in the most recent Annual Information Form filed by Ivanhoe Mines. Readers are cautioned not to place undue reliance on forward-looking information or statements. The factors and assumptions used to develop the forward-looking information and statements, and the risks that could cause the actual results to differ materially are set forth in the "Risk Factors" section and elsewhere in the company's most recent Management's Discussion and Analysis report and Annual Information Form, available at www.sedar.com. This news release also contains references to estimates of Mineral Resources. The estimation of Mineral Resources is inherently uncertain and involves subjective judgments about many relevant factors. Mineral Resources that are not Mineral Reserves do not have demonstrated economic viability. The accuracy of any such estimates is a function of the quantity and quality of available data, and of the assumptions made and judgments used in engineering and geological interpretation, which may prove to be unreliable and depend, to a certain extent, upon the analysis of drilling results and statistical inferences that may ultimately prove to be inaccurate. Mineral Resource estimates may have to be re-estimated based on, among other things: (i) fluctuations in copper prices or other mineral prices; (ii) results of drilling; (iii) results of metallurgical testing and other studies; (iv) changes to proposed mining operations, including dilution; (v) the evaluation of mine plans subsequent to the date of any estimates; (vi) the possible failure to receive required permits, approvals and licences, or changes to any such permits, approvals or licences; and (v) changes in laws, rules or regulations, including changes to tax, VAT, and royalty rates whether to be applied prospectively or retroactively.